MyUninstaller is a light weight program to uninstall the programs from your computer. It is a nice replacement to the default Add/Remove Programs option. Add/Remove programs applet works but it is slow to respond, it takes ages to load all the programs. MyUninstaller is pretty fast compared to Add/Remove programs applet and provides some more details about the programs installed like product name, version, company, description etc. After uninstalling the selected you can save a list of installed programs as text or html file. 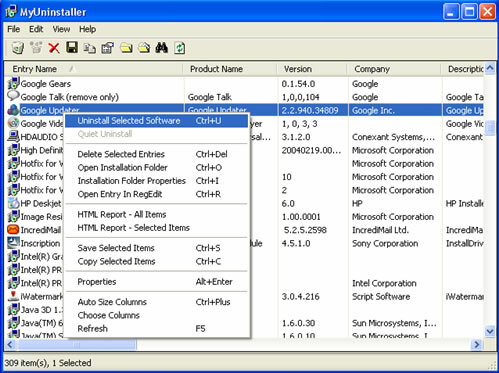 MyUninstaller is a freeware, and is light weight meaning you can carry it with USB drive. it is a standalone application and there is no installation. When you open the application it displays all the installed programs in your computer.